The Kawasaki Mule Pro-FX side-by-side has proven to be the right tool to get the job done while also providing fun on the trails. To build its reputation and offer premium styling, Kawasaki is announcing the 2017 Kawasaki Mule Pro-FX Ranch Edition. 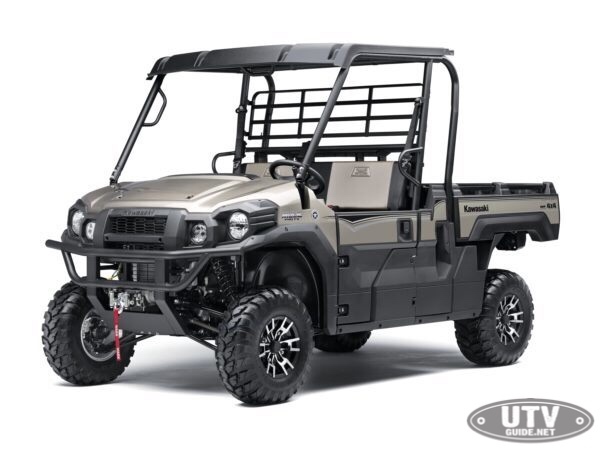 The Mule PRO-FX Ranch Edition model features premium styling cues including a durable painted Metallic Titanium hood, a two-tone seat cover embossed with the Ranch Edition logo, aluminum wheels, LED headlights, a composite sun-top and Ranch Edition badging. The Mule Pro-FX Ranch Edition comes loaded with a Warn winch, dash mounted rocker switch and corded remote control. 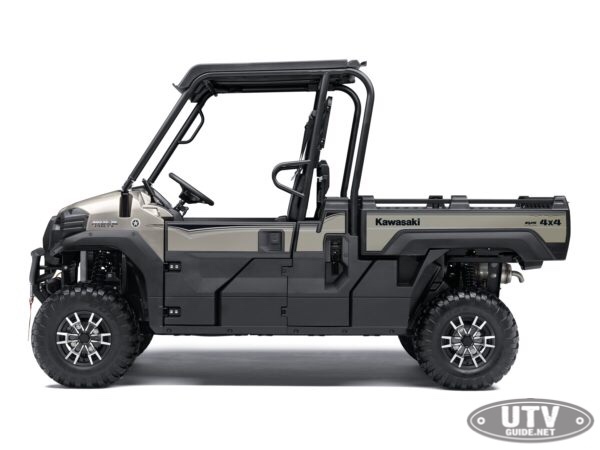 With the extra equipment and premium appearance, the 2017 Kawasaki Mule Pro-FX Ranch Edition stands out from pack in the utility side-by-side market while maintaining the vehicle’s very high standards of performance, comfort and durability. The 3-passenger Mule Pro-FX platform is a great addition to any jobsite as it features a largest in class, steel cargo bed. The fastest Mule side x side ever with a generous 48 lb-ft of torque from its dependable 812cc engine; add that to four wheel independent suspension and wide tread stance which provide a more comfortable ride. The advanced speed-sensitive Electric Power Steering (EPS), comprehensive instrumentation and comfortable thick cushioned bench seat with three-point seatbelts for every occupant means the Mule Pro-FX is also a very capable vehicle on the trails. The Mule Pro-FX is assembled from foreign and domestic parts at the Kawasaki Motors Manufacturing Corp., U.S.A. (KMM) facility in Lincoln, Nebraska to be Kawasaki STRONG and backed by a factory 3-Year Limited Warranty. 12 inches ground clearance and overall length of 133.3 inches and a relatively compact 92.3-inch wheelbase. 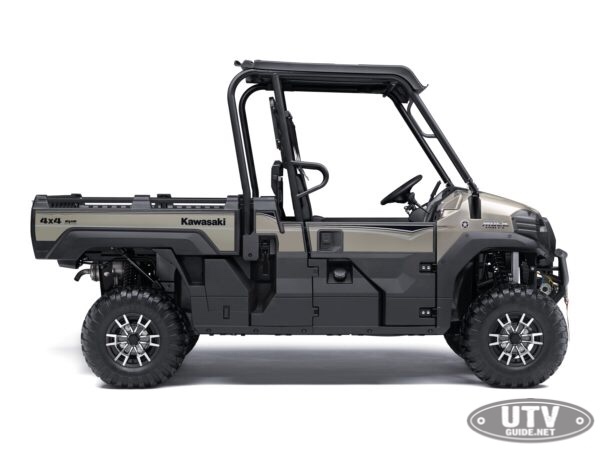 Owners of the Kawasaki Mule Pro-FX Ranch Edition side x side will enjoy the opportunity to further accessorize and personalize the vehicle to accentuate their individual needs and style. Owners wishing to accessorize the vehicle can take advantage of more than 70 Kawasaki Genuine Accessories or opt for a WARN ProVantage Plow System to tackle winter storms. 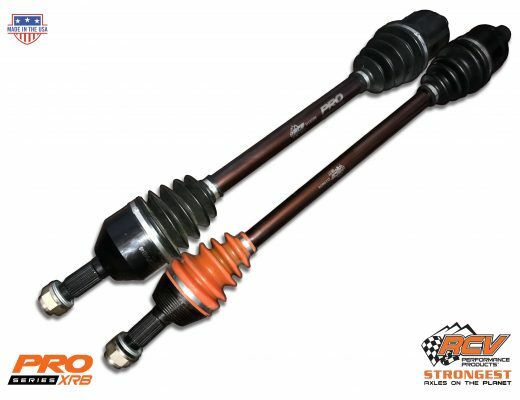 Owners might also choose to provide extra protection for the vehicle, equipping it with both skid plates and brush guards. To help protect the occupants from the elements, Kawasaki offers everything from a complete cab to hard and soft roofs, to full and half windshields as well as hard or soft cabin enclosures and doors. And all these Kawasaki Genuine Accessories were developed alongside the vehicle, for the perfect installation, fit and finish. Mule Pro-FX owners can also choose from accessories such as an audio system, heater, bed extender, cargo divider, dual battery kit and so much more. As an added bonus, the industry-leading Kawasaki STRONG Three-Year Limited Warranty remains intact after the purchase and installation of any Kawasaki Genuine Accessories. Consumers interested to see how their new Mule Pro-FX vehicle will look with Kawasaki Genuine Accessories in place will now be able to build their vehicle online by adding their favorite accessories. They then have the opportunity to print their custom build list and take it to their local Kawasaki dealer to purchase the exact vehicle specification they designed. Visit www.kawasaki.com for full details. Completing the appeal of the Mule Pro-FX is Kawasaki’s promise to keep you running STRONG with our standard Kawasaki STRONG 3-Year Limited Warranty. We don’t just want you to enjoy the King of the MULE family, we want you to live the MULE lifestyle and be inspired by its heritage: a heritage of powerful, durable, fun-to-drive utility vehicles.